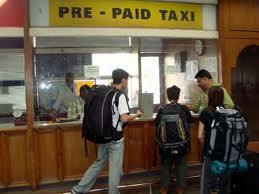 Travelers to India have been warned and some have also experienced the exorbitant cab rates and scams. A few years back some airports in India launched the pre-paid taxis which gave some guarantee that international travelers will not be scammed into double rates than locals. Now, the RTO (Regional Transport Office) will sign a memorandum of understanding (MoU) with the railways which will ensure that pre-paid taxi services commence outside five major Mumbai stations over the next few days. The first service will be launched at the Mumbai Central station, where taxis will ply as far as Alibaug and Virar. A senior RTO official said, “We will launch the prepaid service in phases outside Bandra and Lokmanya Tilak Terminus, Dadar and CST stations. Each prepaid booth will be manned by a separate taxi union.” For example, the one at LTT will be supervised by the biggest union led by A L Quadros while the Sena union will take charge of the prepaid stand at Bandra Terminus. The senior official said the MoU was the last step towards completing all “formalities” for setting up a prepaid stand. The RTO has already installed a special software for storing data on taxis and passengers, and issuing receipts. It will have CCTV cameras capturing pictures of both the drivers and passengers before they start their journey. This is being done for security purposes. Mumbai’s distinctive mix of colonial and Art Deco architecture is one of its defining features. This walk takes you past many of the city’s key buildings and is a great way to spend anything from a few hours to a whole day. Mumbai unverwechselbaren Mischung aus kolonialen und Art Deco-Architektur ist eine der bestimmenden Merkmale. Diese Wanderung führt Sie vorbei an vielen der Stadt die wichtigsten Gebäude und ist ein guter Weg, um alles von ein paar Stunden zu verbringen, um einen ganzen Tag. La inconfundible arquitectura de Mumbai, combinación de arte colonial y estilo Art Deco, es una de sus principales características. Esta ruta le llevará por los edificios más importantes de la ciudad, una manera perfecta de pasar unas horas o incluso todo el día. Actual prices on the respective websites or stores may be different from that mentioned here; please check the prices on the respective websites or stores before purchasing. All prices mentioned on this website are in USD, unless otherwise mentioned. Price for regions around the world may show in their local currency and may be different. We apologize for errors and would love to hear from you.